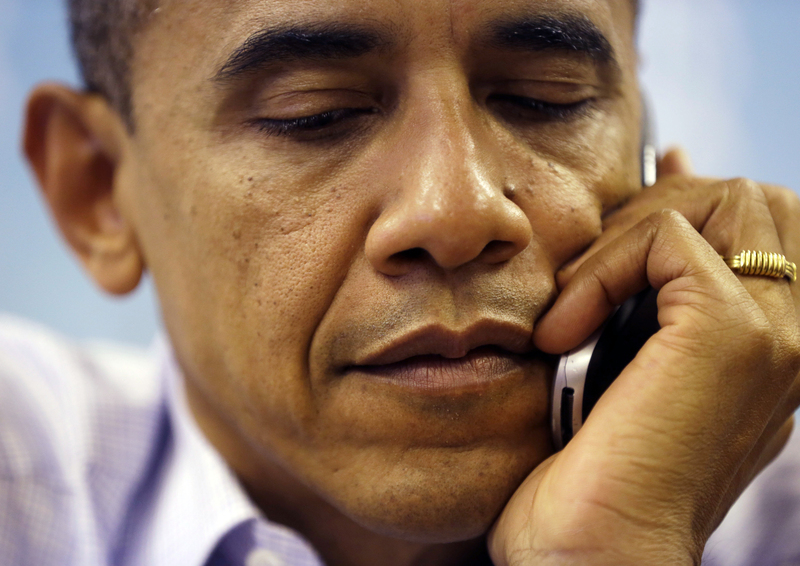 President Obama campaigning on the phone before the debates. You know what’s a bad combo? People are starting to think that President Obama has it in the bag and that Mitt Romney can’t possibly score at Wednesday’s first presidential debate. Here’s the bottom line: Mitt Romney can do whatever he wants and it’ll probably be fine. Why? Because he’s down in the polls — not by a lot, but enough that any strategy will be forgiven as a last resort. Zingers? Sure. Attack the president? Why not? Lie as if his life depends on it? It doesn’t, but he might think it does. The truth is that both Romney and Obama are pretty good debaters. Obama’s been out there deflecting left and right since the campaign started, flashing that bright and toothy grin, quick with the quip, and looking downright presidential. And Romney absolutely acquitted himself in all 500 GOP primary debates. Well-prepared, measured, sane seeming (a rare Republican primary quality) and as facile a liar as you can imagine. Sure, he tripped on that weird $10,000 bet with Rick Perry, and he tagged so far to the right that voters in Massachusetts — who actually supported him as governor — are going to deliver their state for Obama by about 30 points. But if there’s a reason Romney’s the GOP nominee, it’s because he knows how to seem reasonable. In this first debate, the one to worry about is Obama. His signifcant and barely checked self-regard is a continuing concern but, the fact is, he’s also vulnerable in some very real ways on some very real issues. 1. Libya: No matter how you slice this issue, when there are four dead Americans at the end of the story, it doesn’t look good for whomever is president. The fact that the White House seemed as initially confused as Romney on what was going on doesn’t make their case for having a cool steady hand. Surprisingly, though the people of Libya have since rallied in support of the U.S. and the Libyan government has taken steps to arrest the perpetrators, neither the White House nor the U.S. media have been good at showing that part of the story. 2. Univisión just broadcast a devastating report on the Fast and Furious gun scandal. Obama was damn lucky it was in Spanish and most of his detractors basically never heard about it. But if by chance Craig Romney, the Spanish-speaking son, happened to catch it, Romney padre could hit fast and furiously with the details of this absolutely irresponsible gun-running program. Between this and Libya, it could cost Obama few foreign policy points of his advantage on Romney. 3. “If I don’t have this done in three years, then there’s going to be a one-term proposition.” Remember that? It was Obama in a 2009 NBC interview. It doesn’t matter that he was talking about the pace of recovery rather than recovery itself. That’s a heck of a subtlety and if anybody on Romney’s team is thinking (admittedly a long shot), then this little chestnut will be front and center. That’s one ugly little quote that requires a lot of massaging and a sprinkle of suspension of disbelief to be swallowed. 4. A significant number of Americans still think the country’s on the wrong track and give Obama less than 50 percent approval. No president has ever been re-elected with numbers that low, ever. 5. While the media focuses a whole lot on how unlikeable Romney is, it tends to dismiss Obama’s haters as racists and the basic point gets missed entirely: Some people hate Obama. It hardly matters why. (Don’t write in, please, to tell me it does matter. Nothing will change by Wednesday night on this score so, for practical purposes, it doesn’t matter.) They loathe and despise him. And whatever tiny misstep the president might make will be amplified and pounced on by the conservative media until the next debate. Mark my words: There will be a turn of phrase, a look, a thing, that conservatives will be blasting from the rooftops post debate as the undeniable proof that Obama is Satan’s child.